" Bought our second caravan from John Charles Caravans this year and were very happy with the service received, also staff were very helpful giving us lots of advice regarding the suitability of the right caravan for our needs. The caravan was delivered to our chosen site, in which a member of staff ran through the working of the caravan, set up caravan on our pitch and fixed Alko wheel lock. We would be more than happy to recommend John Charles Caravans to any future customers, they are all very friendly and efficient." DISCLAIMER: Whilst every effort has been made to ensure that the details and layout of each vehicle is accurate, please telephone to check that the information is correct and that the vehicle is still for sale before travelling. All accessory’s seen in photos are display only. Bedding and other items are not included. We price check our stock regularly against other retailers on the internet. 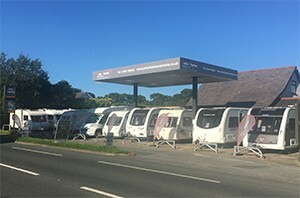 Our prices do not include Motor movers, hitch locks, awnings or any accessories giving you the caravan at the best possible price and a choice on any extras. Some of these may also have been removed since the pictures were taken. Please ask for details and prices. John Charles Caravans is authorised by the FCA with Limited Permission to conduct certain credit related activity.